Voters in Arkansas, Georgia, Kentucky, and Texas headed to the polls on Tuesday in a Southern batch of primaries that could help give Democrats insight into whether they should focus on winning over independents or galvanizing the base. In Texas, voters cast ballots in runoff elections between the top two candidates that advanced from the first round of voting back in March. Marquee races included a Democratic U.S. House primary in suburban Houston marred by national party meddling, a historic Georgia governors race where the nominee will be a woman for the first time in the state's history), and an expensive battle in a deep red Kentucky House district between two compelling Democratic candidates trying to wrestle a seat away from an incumbent Republican. Polls closed in Georgia and Kentucky at 7 pm EST, in Texas at 8 pm EST and in Arkansas at 8:30 pm EST. Lizzie Pannill Fletcher defeated Laura Moser in the Democratic primary in Texas’ 7th Congressional District – situated in the Houston suburbs. TX-07 became a marquee race when the Democratic Congressional Campaign Committee (DCCC) decided to release a mountain of opposition research on Moser to try and prevent her from advancing the first round of Texas primary voting back in March. Fletcher now goes on to face GOP Rep. John Culberson in November in what is expected to be a highly competitive race in a district Hillary Clinton won in the 2016 presidential election. Lupe Valdez, a Latina, openly gay ex-sheriff has won the Democratic nod to face Gov. Greg Abbott in the fall. Her bid is historic — she is the state's first Latina and openly gay gubernatorial nominee. However, several of the top editorial boards in the state expressed some concern about her candidacy. "When she spoke to our editorial board earlier this year, she demonstrated startlingly little expertise on any subject outside her law enforcement wheelhouse," the Houston Chronicle wrote this month. The Dallas Morning New wrote in February: "We were disappointed by her gross unfamiliarity with state issues, however, particularly an almost incoherent attempt to discuss state financing." MaryAlice Parks reports. Combining Tuesday night's winners (and likely winners that have not yet been projected), at least half of all the Democratic candidates for the U.S. House in Texas will be women. Right now 18 Democratic women (and two Republican women) have either advanced to the November election from March's first round of voting or from tonight's runoff elections. Georgia governor Republican primary: Georgia Lt. Gov. Casey Cagle will face Georgia Secretary of State Brian Kemp in a July 24th to be the Republican nominee facing Democrat Stacey Abrams in November. Cagle made national headlines when he threatened to end a tax break for Delta Airlines, which is based in Atlanta when Delta ended a longtime partnership with the National Rifle Association (NRA). Kemp ran to the right of Cagle in the primary, highlighting his support for the 2nd Amendment in his campaign ads. 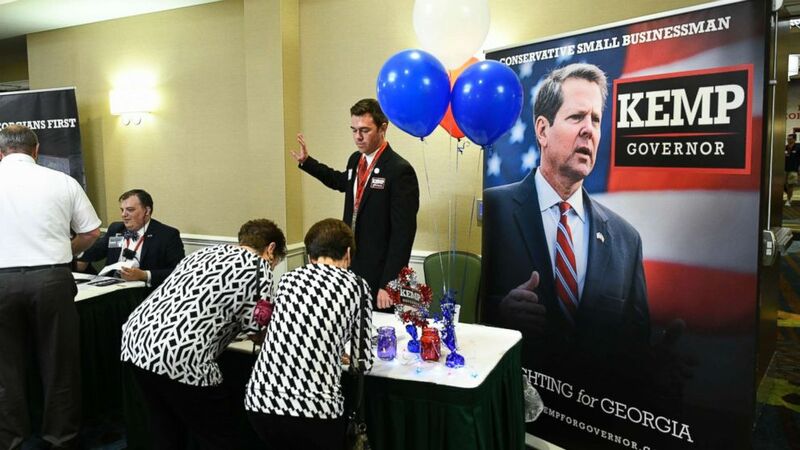 (John Amis/AP) Guests sign in to attend an election night results party for Georgia Secretary of State Brian Kemp, Republican primary candidate for governor, May 22, 2018, in Athens, Ga.
Georgia's 2nd Congressional District: Democratic Rep. Sanford Bishop will face Herman West, Jr., the brother of former Florida Congressman Allen West, in the general election in this southwestern Georgia district that is the home of former U.S. President Jimmy Carter. Texas’ 23rd Congressional District: Gina Ortiz Jones, a gay Air Force veteran, defeated Rick Treviño, a progressive teacher, in the Democratic primary to take on GOP Rep. Will Hurd. Hurd has carved out a reputation as one of the more bipartisan members of Congress, and immigration is an issue that looms large in this district that stretches from the El Paso suburbs to the San Antonio suburbs along the U.S.-Mexico border. Hillary Clinton narrowly won the district in the 2016 presidential election. Texas' 32nd Congressional District: Former NFL player Collin Allred defeated former Obama Administration Agriculture Department official Lillian Salerno in the race to take on GOP Rep. Pete Sessions in this suburban Dallas district. The DCCC added Allred to their “Red to Blue” list for top-tier candidates, and are looking to put him in better position to defeat Sessions in another GOP-held Texas district that Hillary Clinton won in 2016. Former Georgia State House Minority Leader Stacey Abrams won the state's Democratic gubernatorial primary against former Georgia State Rep. Stacey Evans. Abrams could be poised to make history as the country's first black female governor if she wins the general election in November. 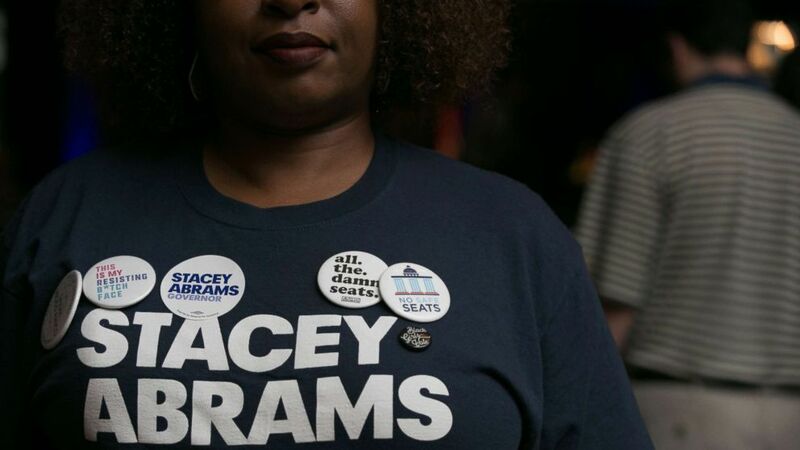 (Jessica McGowan/Getty Images) Supporter Nina Durham is adorned with political pins during the primary election night event for Georgia Democratic gubernatorial candidate Stacey Abrams, May 22, 2018, in Atlanta. Hutchinson, who is seen as likely to win re-election in deep-red Arkansas, will face either Jared Henderson or Leticia Sanders in the November general election (the AP has not yet projected the Democratic race). On the heels of a series of teacher protests in the state, a high school math teacher, Travis Brenda, has defeated state House Majority Floor Leader Jonathan Shell. The race was notable in a state where teachers protested GOP-leadership backed changes to their pensions. Read more about the trend of teachers running for office here. 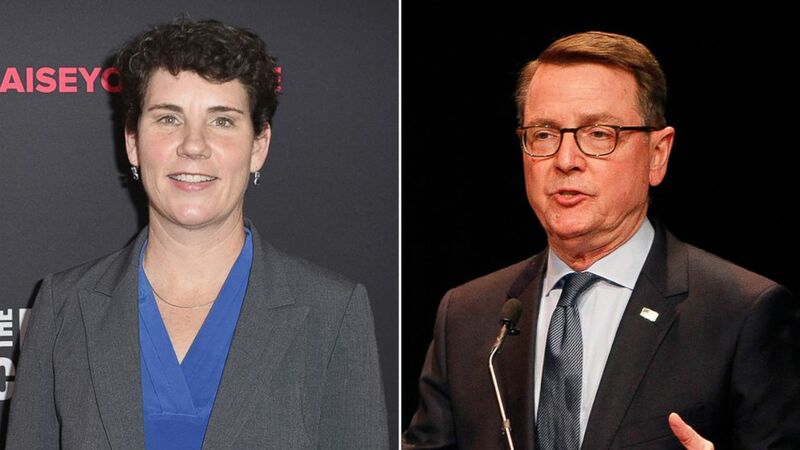 According to the AP, former U.S. Marine fighter pilot Amy McGrath, who burst on the political scene last summer with her campaign announcement ad highlighting her barrier-breaking military career, has defeated Lexington Mayor Jim Gray in the Democratic primary in Kentucky's 6th Congressional District. McGrath will go on to face GOP Rep. Andy Barr in what is likely to be the only competitive House race in Kentucky this cycle. Unofficial results from the Kentucky Secretary of State's office have McGrath up 47.8 percent to Gray's 41.3 percent. ABC News' Steve Osunsami notes: "The one thing I really notice tonight is low voter turnout. At the two polls we visited, the numbers were way down. A third of November." Some of this might be seasonal and weather-related, he notes. But that low turnout could mean election night surprises. 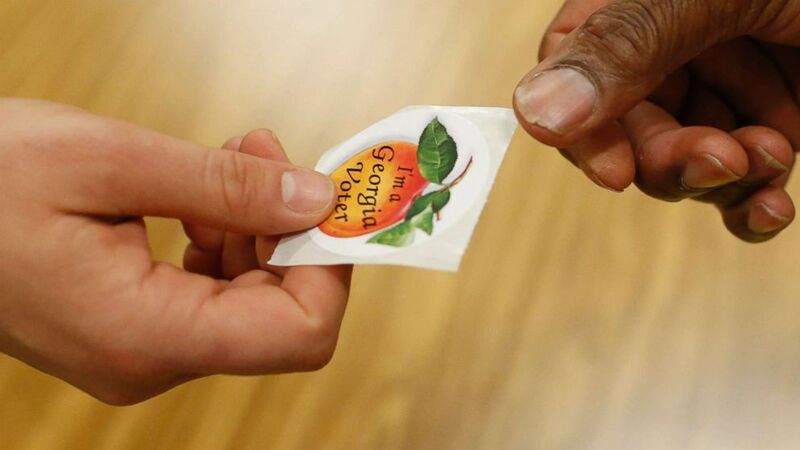 (Joshua L. Jones/Athens Banner-Herald via AP) A poll worker hands a voter a, "I'm a Georgia voter," sticker after casting her ballot in Georgia's primary election at Chase Street Elementary in Athens, Ga., May 22, 2018. "You’ve got five leading candidates trying to make it to a run-off and the presumptive front-runner is the Lt Gov, Casey Cagle. With a low turnout, it doesn’t take much to get to second place in a crowded field." It's 6 pm EST and polls in the eastern half of Kentucky have closed. Polls in the western part of the state will close at 7 pm EST, giving some Bluegrass State voters another hour to cast their ballots in today's primaries. Kentucky's 6th Congressional District, which represents Lexington and the state's capital of Frankfort, is currently represented by Republican Congressman Andy Barr. Today, Democrats are hoping the candidate who emerges from the primary can capitalize on a political environment that re-elected Barr and voted for Donald Trump by 22 and 15 percentage points, respectively, in 2016. (Getty Images/AP) Congressional Candidate in Kentucky Amy McGrath attends The 2018 MAKERS Conference in Hollywood, Calif., Feb. 6, 2018, in Los Angeles. Mayor Jim Gray speaks during a debate for Congress in Lexington, Ky., April 18, 2018. ABC News' John Verhovek reports. ABC News reported on Monday that Stacey Abrams reached out to Senator Bernie Sanders for an endorsement and spoke to him directly on the phone. During the course of their call, the progressive Vermont Independent decided to lend his support and get involved in the race. Seeking the senator’s endorsement was an interesting and perhaps risky move for Abrams, an African American woman and Democrat running for governor in Georgia. Republicans have held the state’s governor’s office since 2003. Instead of zeroing in on swing voters or moderate independents in the southern state, Abrams instead has run, unabashedly, as a liberal during the primary race and made the argument that bold policies proposals and grassroots energy might bring out enough Democrats in the state to flip the seat. ABC News' deputy political director MaryAlice Parks and ABC News' Cheyenne Haslett report. 11:40 a.m. - A mother who lost her son to gunfire is running for U.S. Congress in Georgia: "To not do anything is a tragedy"
“I was just as angry and devastated on Friday with Santa Fe as I was for Parkland, because Jordan was the same age as all these children that have been gunned down,” Democratic candidate for Georgia's 6th Congressional District Lucy McBath told ABC News. Her son Jordan was 17 years old when he was shot and killed in 2012 by a stranger at a gas station. 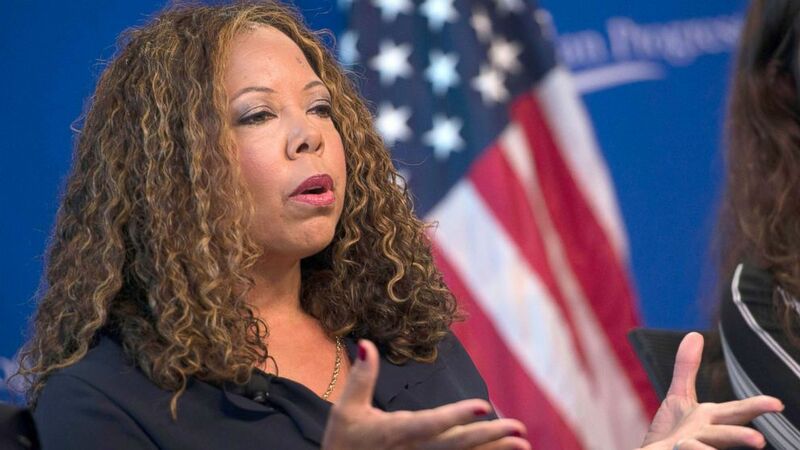 (Leigh Vogel/Getty Images, FILE) In this file photo, Lucia McBath, faith and community outreach leader for Everytown for Gun Safety, speaks about gun violence and the death of her son Jordan Davis, at the Center for American Progress event "Debbie Allen On Arts and Lived Experience: Race, Violence, And Access To The American Dream," Oct. 24, 2016, in Washington, DC. Now, she's part of a growing movement: parents who are running for office because they've lost children to gun violence. Among this group is two parents from Parkland, Florida, who decided to run for their county's school board after their teenage daughters were killed in February. “I never expected this to happen but I know that in light of all my experiences, to not to do anything is a tragedy in itself,” McBath said. She'll face three other Democratic candidates on Tuesday: former TV news anchor Bobby Kaple, businessman Kevin Abel and management consultant Steve Knight Griffin. Kaple, who had $290,000 in the bank at the end of the pre-primary reporting period, has the endorsement of Congressional Black Caucus Chairman Cedric Richmond of Louisiana, and numerous prominent Democrats in the state. ABC News' Cheyenne Haslett reports. 11:30 a.m. - As they leave the polls, here’s what Georgia voters are telling ABC News. Angelica Geter, a public health scientist at the Morehouse School of Medicine, voted for Democratic candidate for governor Stacey Abrams: “We think about what happened in Alabama. The people who ultimately led that victory was black women. Black and brown women, having that particular vote. She’ll be fine,” said Geter, who is also an African American woman. If elected, Abrams would be the first ever female African American governor. ABC News' correspondent Steve Osunsami reports. In ABC News' daily political email newsletter, political director Rick Klein wrote about a commonality in these four states and their primaries: "With four red states voting on Tuesday, Democrats’ main problem at the moment isn’t in finding viable contenders so much as it is what to do with too many of them." And deputy political director MaryAlice Parks wrote about the difference a Democratic wave could make in Texas, where voter turnout is low: "Experts say Texas’s low turnout has been partially due to a perception that few races were actually competitive. This year though, for the first time in 25 years, a Democrat is running in each of the state’s 36 congressional districts. More than a dozen Democratic congressional primaries were so jammed packed they went to the run-offs today."